Cairo comes alive at night. It is the best time to shop, eat delicious Middle Eastern cuisine, or simply watch the world go by from a pavement cafe'. You can dine in a floating restaurant on the Nile, sample a shisha at a coffee-shop or see oriental dancers and cabarets at a luxury hotel. The splendid Opera House complex houses several galleries (including the Museum of Modern Art), restaurants and concert halls. Listening to Arabic music under the stars, in the open-air theater, is a magical experience. At El-Ghuriya, in the heart of Islamic Cairo, you can watch folk musicians and whirling dervish dancers. 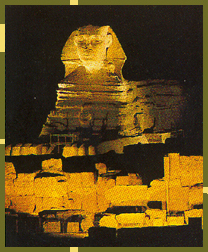 Don't forget the most essential after dark experience, the Sound and Light show at the Pyramids, a dramatic fusion of light and music recounting the story of antiquity in different foreign languages.